For most of my life, I believed that I was destined to become an opera singer. My mother put me into voice lessons at the age of seven, after nearly getting into a car accident with me attempting to sing “Der Hölle Rache,” stating that I needed some new repertoire. I initially started lessons with a college student majoring in vocal performance, who enjoyed being an “opera rebel.” In short, no Disney songs for me! Instead, I learned Italian art songs. Becoming a local novelty as the child opera singer, I was frequently asked to perform at community events, churches, and sporting games. Throughout middle school, I studied classical singing intensely, believing that I would eventually attend a music conservatory and become a full-fledged opera singer. Long story short: only a few years after, I found myself at a liberal arts institution without a music degree, studying economics. This doesn’t mean that I gave up singing or my passion for opera. On the contrary, I have been pursuing these interests in unique ways – combining them with my academic interests. One example is the year-end project I completed for my German 102 language class: “The Wagner Paradox,” contrasting the brilliance of Wagner’s musical and artistic vision, with the bigotry of his personal life and views. Richard Wagner was a man of extremes – there is no doubt about it. Perhaps he is most well-known for composing a series of operas entitled the Ring Cycle (which contains the song “The Ride of the Valkyries,” which has been made famous in part by Bugs Bunny and in part by Apocalypse Now.) Interestingly, it is singlehandedly through the works of composer Richard Wagner that opera has achieved its status of unbearably long operas featuring large-statured women brandishing spears and wearing horned helmets. However, as I stated before, Wagner was man of extremes. Besides his opera, he is probably known for his many strong anti-Semitic writings. Although he was dead before the Nazi regime’s ascension to power, Wagner and his music served as inspirations to Adolf Hitler. For these reasons, despite the strong classical music community in Israel, the music of Richard Wagner has often been viewed as off-limits. A debate regarding breaking the Wagner-taboo was recently resurrected just this past year. However, in my research I found myself fascinated by the 2001 incident in which composer Daniel Barenboim conducted a Wagner work as an encore, and the public outcry which ensued. Thus, when it came to finding a book on Israel, I wanted to find a book which captured the essence of the unique Israeli society. 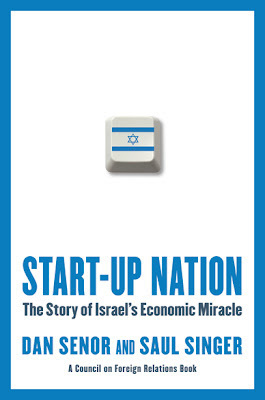 When I read the synopsis to “Start-Up Nation: The Story of Israel’s Economics Miracle” by Dan Senor and Saul Singer, I was immediately intrigued. (You can check out the book’s own website here.) However, I was not prepared for how interesting or thought-provoking this book was. Perhaps it is the economics student in me, but despite the fact that I was reading it while on vacation, I had a hard time setting the book down. So what is this book about? 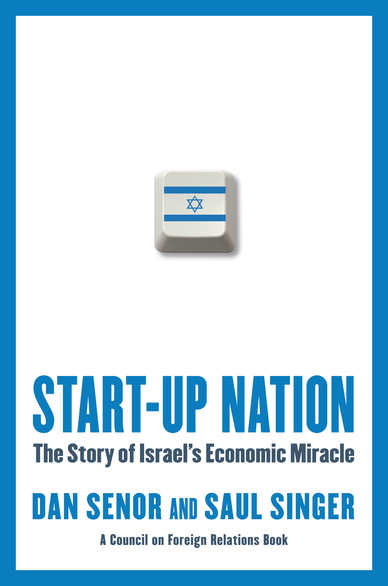 I will begin by sharing a section from the book: “…in addition to boasting the highest density of start-ups in the world (a total of 3,850 start-ups, one for every 1,844 Israelis), more Israeli companies are listed on the NASDAQ exchange than all companies from the entire European continent” (page 11.) While Israel is often compared to other small, exporting-based nations such as Taiwan, Singapore, and South Korea, Israel has a key difference: the innovation factor, which has made the “start-up” business model one of everyday life. This book seeks to find the many different components which contribute to Israel’s atmosphere, which is primed for entrepreneurs. The diversity of the Israeli people: Although Israel is often viewed on the outside as a homogenous population with similar goals, “Israel’s tiny population is made up of some seventy nationalities” (page 17.) For hundreds, if not thousands, of years, Israel’s citizens shared very little – lacking a unified language or similar cultural norms. Chutzpah: This term is defined as “gall, brazen nerve, effrontery, incredible ‘guts’ presumption plus arrogance such as no other word and no other language can do justice to” (page 30.) According to the authors, this is a cultural practice which is permeated throughout all aspects of Israeli society – employee/employer relations, relationships between members of the military, mentor/mentee relationships, etc. The idea is that actions and ideas are always questioned, even if a so-called ‘superior’ has shared them. Military Conscription: The authors view the military conscription, which affects most members of the Israeli population at the age of 18, conducive to the atmosphere of start-ups. First, it gives future business leaders the leadership opportunities and the problem-solving skills that are required from entrepreneurs. It also introduces Israelis to a diverse assortment of people – often outside of their socio-economic status – broadening their experiences. Several other reasons for a pro-business atmosphere are also detailed. For example, the authors state that regional isolation has created an Israeli population that is knowledgeable of the outside world, and prepared to take advantage of business opportunities in different areas. Also, Israel is a leader when it comes to Research and Development – with one of the largest percentages of GDPs dedicated to R&D in the world. The book also describes Israel’s possible hindrances to further growth and development in the future.